To save money, we are not taking a warm weather vacation this year. The economy is squeezing us, and so we figured we'd better make the most of New England: the snow, the slush, the ice-- although these last two are a real drag. Even if we don't want to ski, strapping on some snowshoes and going for a hike is a pretty big win for kids. They don't need any special skills or classes, and snowshoeing makes them feel like they are walking on clouds. 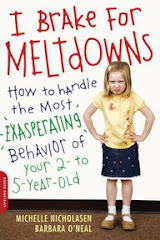 So far meltdowns have been short in duration. What can you do out in the woods anyway? You can provide a snack from your pocket or fix a few mittens. You can't carry the kids the whole way or go home instantly. They have to pick themselves up and march along with you. As a last resort you say, "OK, let's turn around then, and hike back home."